Sony Alpha SLT-A65V review - this amazing digital SLR camera offers great performance at a very good price. The 24.3MP sensor of the SLT-A65V captures the moment in the best way possible. 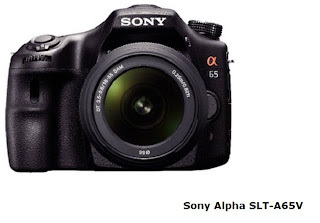 Sony Alpha SLT-A65V offers wide variety of functions that make this camera quite a versatile tool. For instance it can shoot amazing quality Full HD videos with stereo sound (including 24p Cinema Mode) and maximum resolution of 1920x1080. Another great feature is the built in GPS supports the function Geo tagging. Sony Alpha SLT-A65V has plenty of present shooting modes as well as wide variety of manual adjustments. The continuous shooting mode makes amazing full-resolution quality pictures at up to 10 frames per second. Sony Alpha SLT-A65V offers you full manual control over focus and exposure modes. 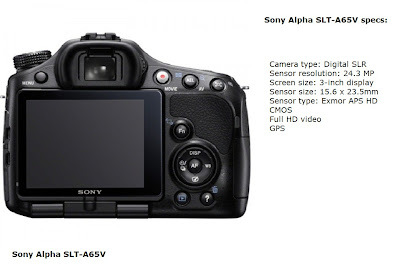 Sony Alpha SLT-A65V price varies around $1000 but you can easily find it cheaper in some online tech stores.